-Albany begins the week at 14-10-2-4, good for 34 points and a tie for 4th place in the Northeast Division (and 7th in the Eastern Conference). 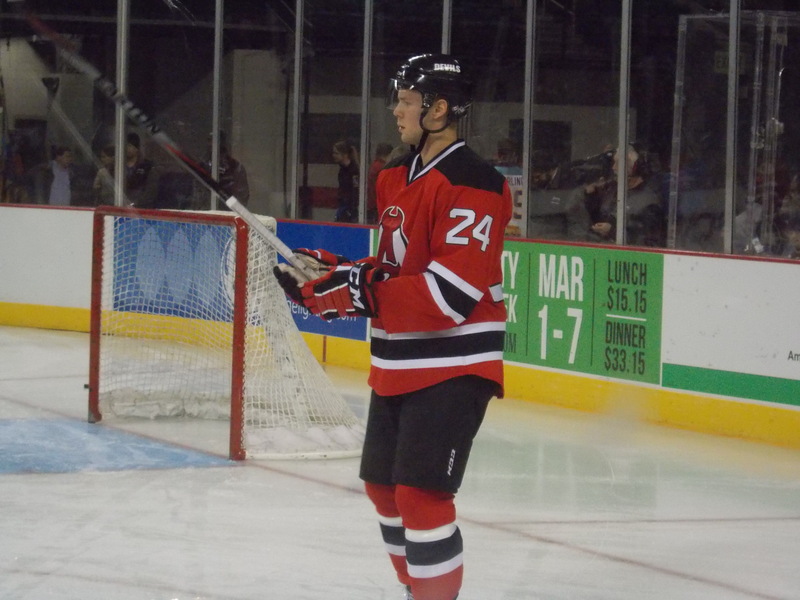 -On Monday, forwards Joe Whitney and Stefan Matteau were recalled to New Jersey. Matteau sat out as the extra forward, while Whitney made his second NHL appearance on the fourth (!?!) line with Tim Sestito and Jordin Tootoo. 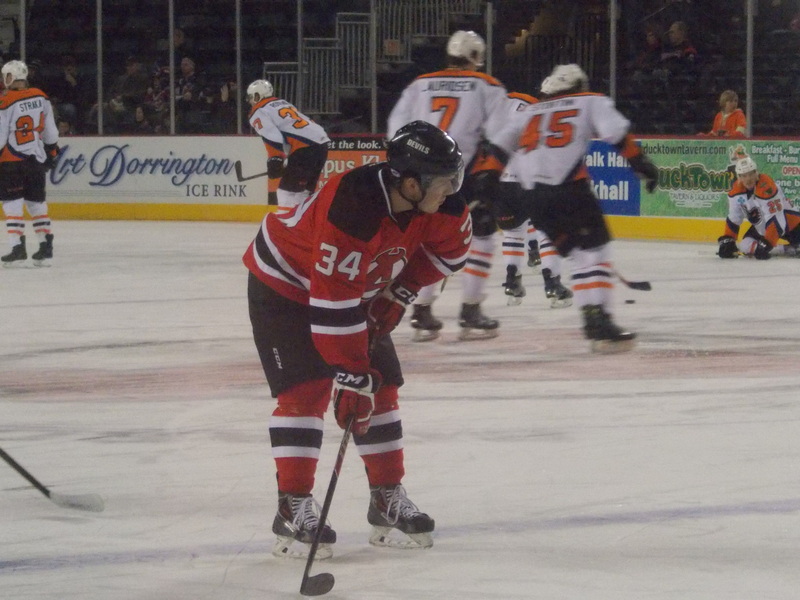 -Tuesday morning Mike Sislo was recalled yet again to New Jersey after both Stephen Gionta and Jacob Josefson were placed on IR. -Providence is missing 4 of their top 6 leading scorers: rookie David Pastrnak, who is representing the Czech Republic at the World Junior Championships, and three others are on recall to Boston. -The Bruins are at the end of a 5 game road swing, and the trip has not been kind, only having one overtime win over Portland. They traveled to Manchester twice in 7 days and only snagged an overtime loss point, with a shutout loss to Bridgeport in between. Season Series: Syracuse leads 3-0. -The Crunch’s 10 game winning streak finally came to an end on Saturday, with a regulation loss to Worcester on home ice. They dropped an overtime decision to division leader Springfield on Sunday afternoon. 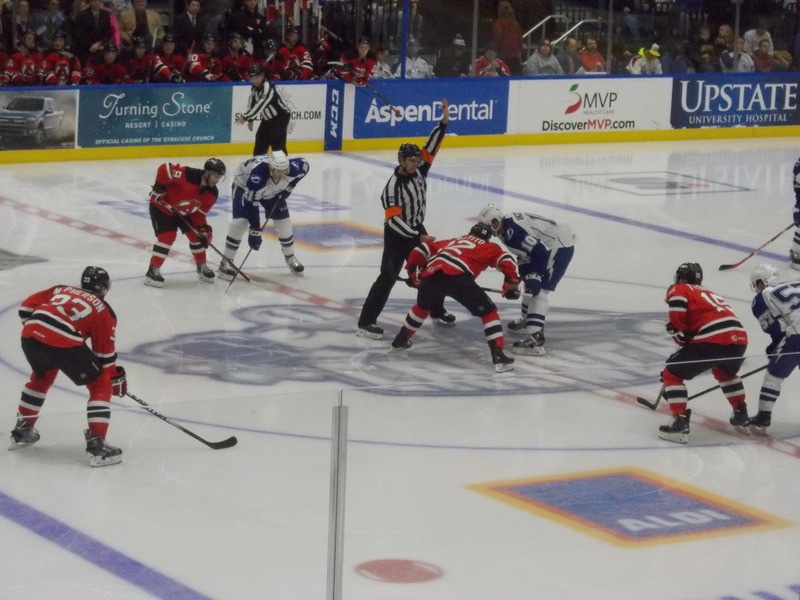 -Sunday also marked the beginning of a 5 game road trip for the Crunch. They visit Rochester on Wednesday afternoon before coming to the Capital Region. -After three matchups in a 13 day span, the two teams will not see each other again until February 20th in Syracuse. When: 7:00 PM Saturday, 3:00 PM Sunday. Season Series: Bridgeport leads 4-2. -The Sound Tigers swept the weekend, not giving up a single goal to Providence or Wilkes-Barre/Scranton. -Bridgeport travels to Worcester on Tuesday and Providence on Friday before welcoming Albany in for the weekend. -The series is the first matchups between the teams since a 5-2 Devils win on November 23rd in Albany. This after the Devils saw Bridgeport 6 times in their first 17 games. Extended gallery, including fight photos from Friday, over on the Facebook page! Back to work after Christmas for the Devils, and it was a daunting task…taking on the top two teams in the division, along with dealing with the turmoil up top and the possibility of more callups, not to mention the mumps epidemic showing up. But they persevered, taking three out of four points in two fought out thrillers. While New Jersey was cleaning house behind the bench, Albany was off to Onondaga County for the second time in 6 days for a rematch with the Crunch, who were looking to extend their winning streak to double digits. First period had no scoring, but a renewal of physical play from Saturday’s matchup, as both teams combined for 22 penalty minutes. Second period saw more scrums…and both teams exchanging goals, as Brandon Burlon gave the visitors a 1-0 advantage just under 5 minutes into the period. After a missed penalty shot by teammate Nikita Nesterov just a minute and a half earlier, Mike Blunden would tie it up with 7 minutes to go. Reid Boucher continued his hot streak early in the third period with his 8th (also his 5th straight game with at least one point) to put Albany ahead 2-1. With the way the team and Scott Wedgewood was playing, the Crunch winning streak was in danger of coming to a halt at 9 games. But…an unlikely hero emerged, as former River Rat Joey Mormina would tie the game at 2 with just 1:27 remaining in regulation. Albany had a chance of ending things with a 4 on 3 power play to start overtime, but no such luck. After another scrum, the teams would go to 3 on 3 early during the extra session…and Vladimir Namestnikov would be the hero, getting the game winner with just under 3 minutes to go to extend the Crunch winning streak to 10…and the overtime woes continue for Albany. Wedgewood played outstanding despite the loss, stopping 34 of 37 shots. Joe Whitney contributed two assists and Joe Faust had his second career point assisting Boucher’s goal. 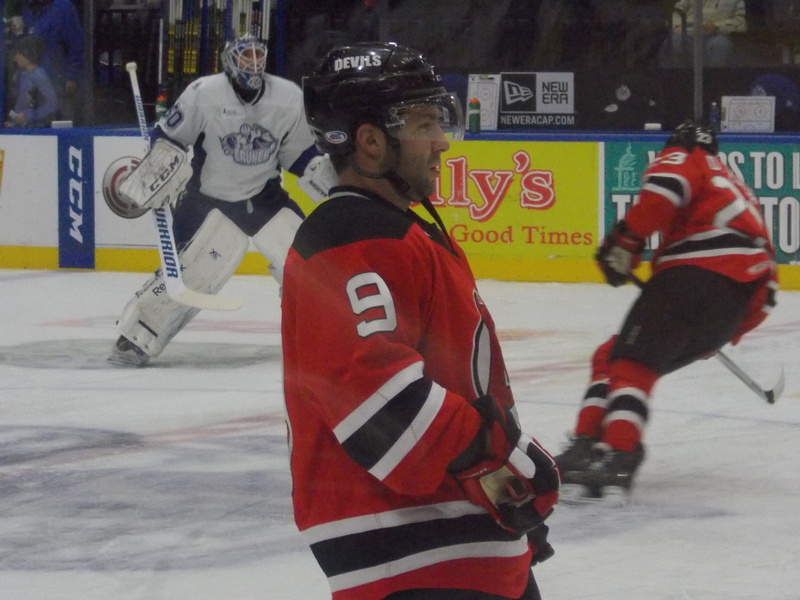 Saturday: After the reveal of the three headed coaching monster behind New Jersey’s bench, Tim Sestito was recalled yet again, and he skated on the fourth line at MSG with Jordin Tootoo and Stephen Gionta in a 3-1 loss to the Rangers. 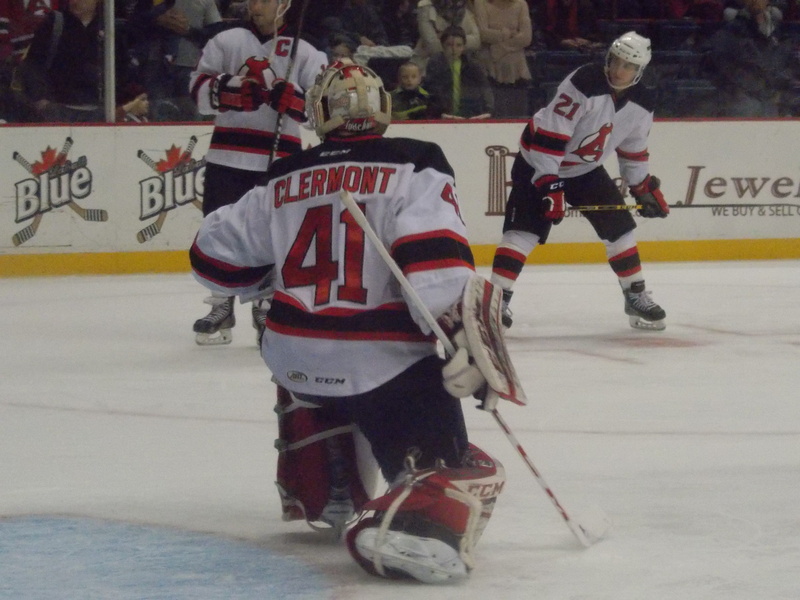 And the reason for Maxime Clermont’s mysterious recall was also answered: Scott Clemmensen became the fifth Devil to fall victim to the mumps. Let us pray that no one else on the current roster here is next in line. For the first time in 20 days, Albany was finally back on Times Union Center ice, playing host to the Falcons for just the second time this season. After a relatively uneventful first period that saw both teams stay off the scoresheet, the Devils got on the board in a big way in the second. David Wohlberg (on a nice breakaway shot) and Graham Black would score 32 seconds apart for a 2-0 lead. But the visitors would tie on two straight power play opportunities over a 3 minute span from Josh Anderson and Frederic St. Denis (doing his best Gelinas impression). 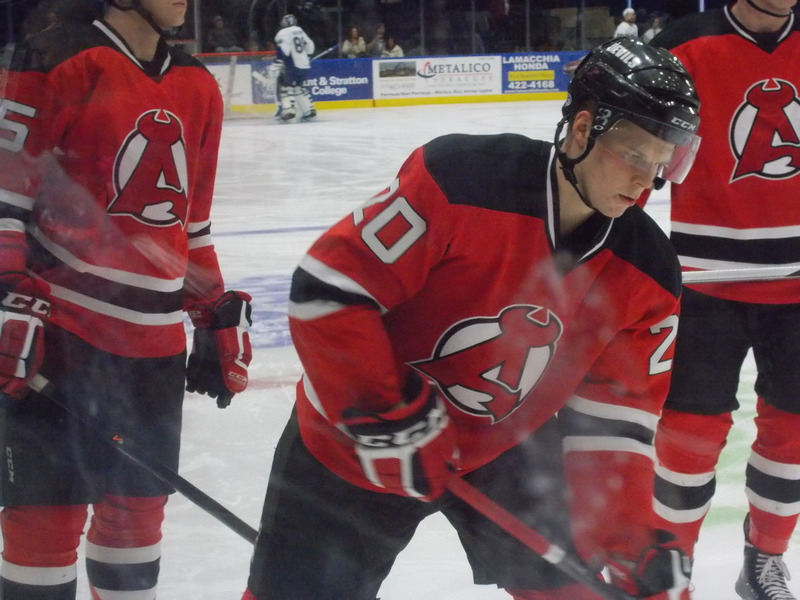 Reid Boucher extended his scoring streak with a power play goal of his own to put Albany back up by one. Then the penalty kill let the team down again, as Ryan Craig would tie it up at 3 with 12 minutes to go in regulation. It was on to overtime for the second straight night, and things ended in a hurry…Joe Whitney would score the game winner just 34 seconds in for the win, the second OT win for the Devils in 13 days after going almost 3 years without one. Another strong performance in net by Scott Wedgewood, as he stopped 22 of 25 shots in picking up his 5th win. Whitney had two more assists, while Reece Scarlett and Brandon Burlon each had helpers. Pop Quiz: If Maxime Clermont gets a start in net during his recall, he will be the 5th goaltender to make an appearance. 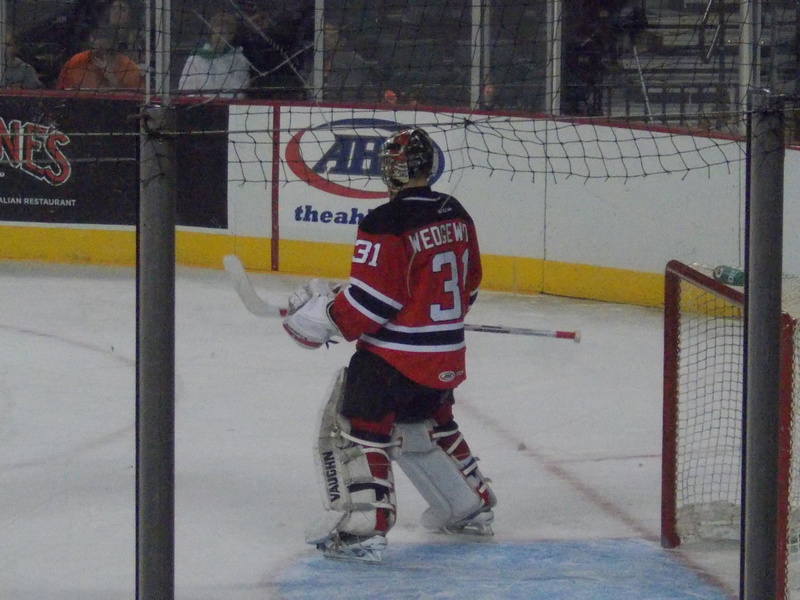 Which Albany AHL team saw the most goaltenders see action during one season? The answer upcoming. After Mark Fraser raised the roof last Saturday night, this was pretty much expected. Four assists and the game winning overtime goal on Saturday? A very good two days for Joe Whitney. Honorable mention to Reid Boucher for his continued hot streak. Chris McKelvie and Cam Janssen rejoined the lineup on Saturday. 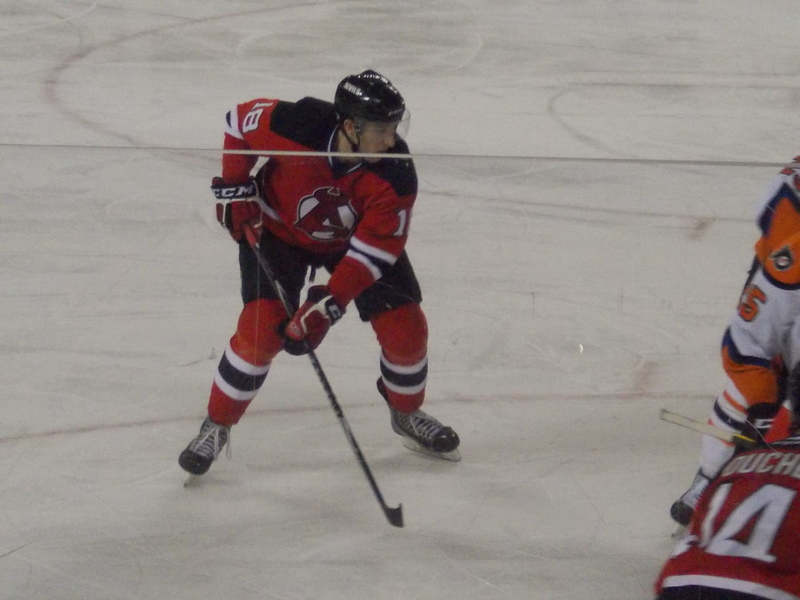 Kelly Zajac is practicing and close to returning, while Raman Hrabarenka and Scott Timmins remain out. Mike Sislo missed the week due to illness, fingers crossed it’s not the M word. A very busy schedule this week to close out 2014 and ring in 2015. Tuesday night Providence makes their only visit to the Capital Region. Then Syracuse comes calling again on Friday, but this time on home ice. Then it’s off to Bridgeport for matchups on Saturday evening and Sunday afternoon against the Sound Tigers, the last visit to southern Connecticut for the regular season. Pop Quiz Answer: A whopping 7 different goaltenders appeared in at least 1 game in the River Rats inaugural 1993-94 season: Corey Schwab (51 games), Peter Sidorkiewicz (15), Mike Dunham (5), Matt DelGuidice (5), Chad Erickson (4), Mark Gowans (1), and Brian Langlot (1). Tied for second place are the 1995-96 River Rats (Dunham, Sidorkiewicz, Schwab, DelGuidice, Andre Racicot, Mike Heinke) and the 2005-06 Rats (Frank Doyle, Ari Ahonen, Gregg Naumenko, Scott Clemmensen, Josh Disher, Chris Terreri) with 6 each. -Albany returns from the Christmas break with a record of 13-10-1-4, good for 31 points and 4th place in the Northeast Division (8th in the Eastern Conference). -A lot of Thruway travel for Tim Sestito this week. 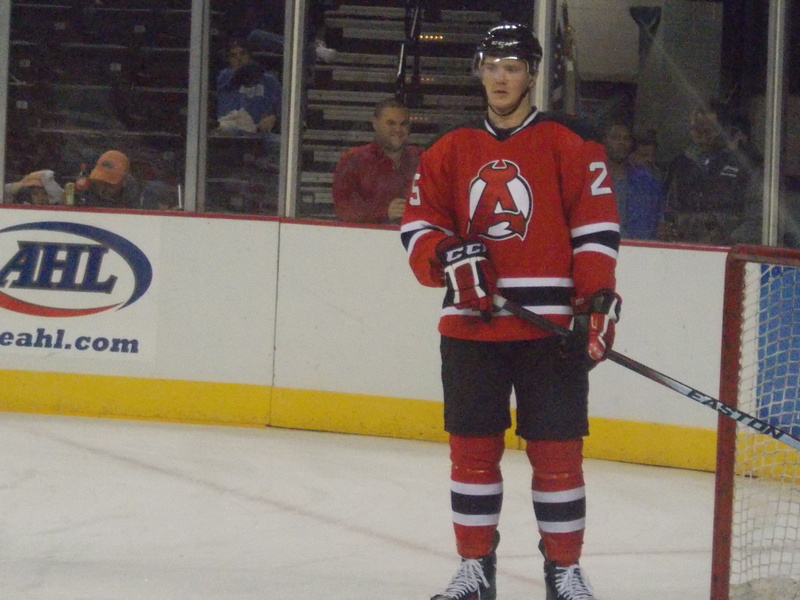 He and Mike Sislo returned to the Albany roster on Sunday after both appeared in Saturday’s loss to the Capitals. But Sestito was right back in New Jersey on Monday, and in the lineup for the Devils’ shootout loss to Carolina on Tuesday. He was then reassigned to Albany on Wednesday. So we’ll see if he’s still around this weekend or if he ends up in New York on Saturday when New Jersey travels to MSG to take on the Rangers. -Per the AHL transactions, Maxime Clermont has been recalled from Orlando. Stay tuned as to who he will be sitting in for. Season Series: Syracuse leads 2-0. -The Crunch are looking to build on a 9 game winning streak, the longest since becoming Tampa Bay’s affiliate after the 2011-12 season. -The Lightning returned goaltender Andrei Vasilevskiy to the Crunch on Wednesday, after earning his second NHL win against Pittsburgh on Tuesday night. -The Falcons begin the week with a modest two game winning streak after sweeping the weekend with wins in Binghamton and Hershey. They will travel to Hartford on Friday before coming to the Capital Region on Saturday. -For the first Capital Region home game since December 7th, it’s a holiday special: $10 tickets (box office only) and the first 1500 get a free helmet bank. -Albany begins the week with a record of 12-9-1-4, good for 29 points and 4th place in the Northeast Division (and 8th in the Eastern Conference). -After appearing in Monday night’s shootout loss to the Islanders and coming close to getting his first NHL goal, Tim Sestito was reassigned to Albany on Tuesday with the return of Patrik Elias to the lineup for Wednesday’s home game against Ottawa. 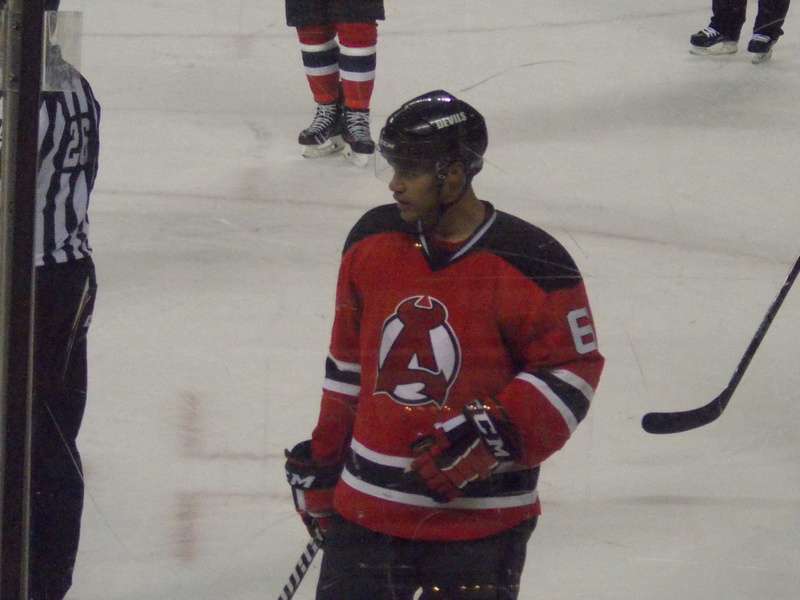 -Mark Fraser was officially signed to a 1 year 2 way contract by New Jersey and was placed on waivers. He cleared on Friday and will stay on the Albany roster. -Before leaving for Pennsylvania Thursday, a few more roster tweaks: Myles Bell was reassigned to Evansville after appearing in 2 games. With Jacob Josefson possibly out for New Jersey’s two weekend home games, Sestito was once again recalled (there goes the E-Z Pass bill), and defenseman Adam Larsson was assigned to Albany on a conditioning stint (and we may be using that term loosely after his extended “conditioning” stint here last season). Larsson has been out since December 2nd after falling victim to the NHL mumps epidemic. In 17 games he has 4 points (1 goal, 3 assists). -The Penguins are currently missing 6 regulars due to injuries and illness in Pittsburgh decimating the parent club. -Wilkes-Barre is coming off a near perfect 3 for 3 weekend, with a shootout loss to Lehigh Valley the only blemish. 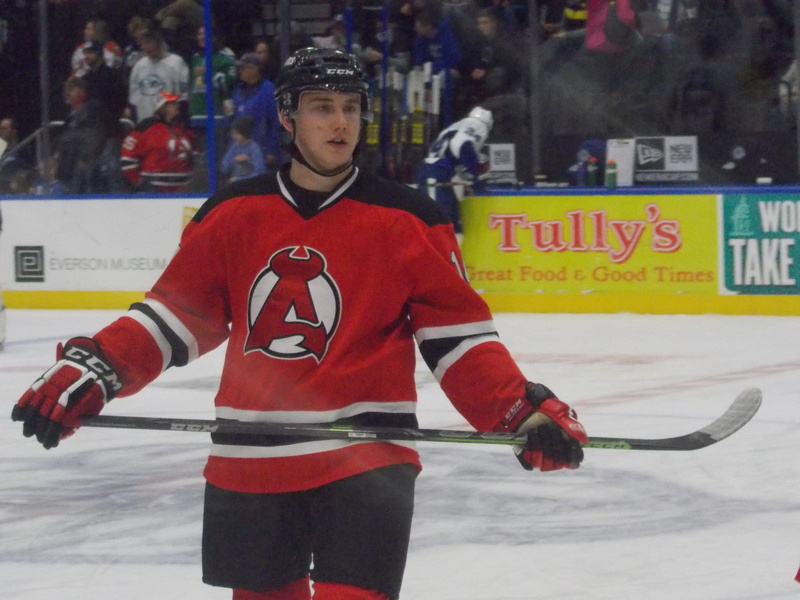 -Since the Devils move to Albany in 2010, the franchise has only won twice on Wilkes-Barre’s home ice, the last victory coming on November 8, 2013. Season Series: Crunch leads 1-0. -The Crunch are riding a 7 game winning streak heading into the pre-Christmas weekend, pulling into a tie with Springfield for the division lead. After defeating Rochester on Wednesday night, they will travel to Hartford on Friday before hosting the Devils on Saturday. -Syracuse recently lost starting goaltender Andrei Vasilevskiy to callup after Lightning goaltender Ben Bishop got injured. Former RPI goaltender Allen York has been summoned from the ECHL to back up Kristers Gudlevskis. -Good news for local Time Warner subscribers: the game will be televised locally on TWCS, Channel 50 in the Albany area. As always, extended gallery on the Facebook page.